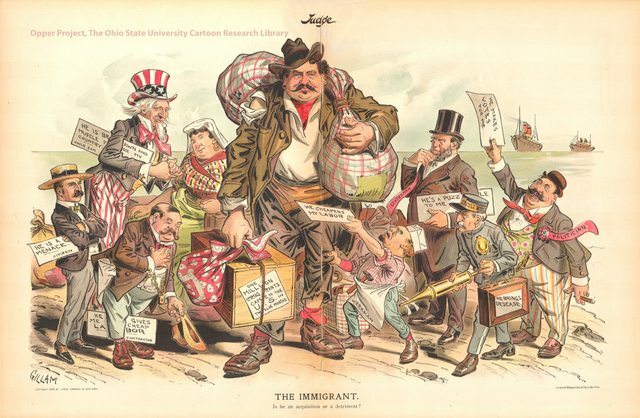 The Immigrant: Is he an acquisition or a detriment? Note the uniformed figure on the right, apparently a health official of some kind, carrying what's either a bug-spray pump or a giant syringe. His worry: "he brings disease." "Health" and bigotry go had in hand, because all of the worst forms of bigotry attempt to mobilize the instinct of contamination avoidance. The idea is to portray certain of your neighbors as carriers and sources of disease, so that touching them or being close to them is disgusting and frightening. The Irish were thought to bring cholera. Poor Southern whites have lice and worms. The Chinese brought drug addiction, and so did the Mexicans. Hispanics brought yellow fever. And now, of course, we have "secondhand smoke" and campaigns to turn smokers into lepers. And the worst thing is that the fanatics who start these campaigns of hate think they're doing us all a favor. There is not a lick of difference between the anti-smoking agitators and the Westboro Baptists.